Sounds of the Century is a program to develop phonemic awareness skills in young children. It has been written specifically for working at a whole class level, with the idea of rotating groups of children through the various activities in the program. However, it is also well suited for individual therapy as home practice as most of the activities are presented in a game format. The phonological awareness activities are presented in themes, which helps to contextualise the activities and skills, and make the learning more purposeful. Each lesson plan comes with all resource materials that my be required for the activities, and are presented as black line masters for use in the clinical setting or home follow-up. 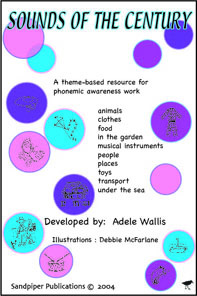 The program covers all the aspects of phonemic awareness and some cognitive skills: rhyming identifying and generating; sound identification; counting syllables; manipulating sounds - deletion and changing; word segmenting; sound blending; sound symbol association; memory; categorisation; association etc. The themes currently covered include: transport, food, clothes, toys, people and occupations, animals, under the sea, places to go, musical instruments, in the garden.